I'm going to be off the blogging grid for the next few days. I'll be back early next week with some photos of what I'm up to. But before I go, I'm going to answer the last few questions that came my way. mxq asked: i LOVE your picture posted of brooklyn. did design it? if you ordered it, can you say from where? I wish I had designed it because these are clearly a gold mine - but no, its not mine at all. You can find it as well as other cities versions at Ork. cubbear asks: So are you a self taught designer? How did you get started on your business? Yes, I'm self taught although I tend to think most are. Even the ones that go to design school were likely designers well before their first class started. My business started very organically. I did some favors for friends and then friends of friends. At the time when I started there just wasn't that many options for people who wanted affordable custom designs. It got to the point when I though 'maybe total strangers would pay for this?' and they did! I don't have as much time as I would like to devote to it so I keep a very limited client list and turn away a few too many clients when I'm overbooked. But thats okay, it keeps it fun for me. Emma asks: Are you finding the white cabinets hard to maintain? Do they show dirt easily? They are not "hard" to maintain but yes, the do show dirt a little more easily. Its really no problem because if something splatters than a) I would like to know it so I can clean it and b) it just takes the wipe of a wet paper towel to clean up. The cabinets are painted with some sort of finish that makes it very easy to clean. Joyce asks: Also, are grandma and grandpa Limestone living in the garden floor?  Yes, Mr. Limestones parents live on the garden floor apartment. Everything being on one level was the whole point of having them move in with us. Their apartment looks nothing like our space does. Suffice to say Italian senior citizens don't keep up with the trends. So we made their apartment into something they would appreciate rather than what we preferred. All that said, there won't be any tours of their place on this blog. Thats their private space. A few people have asked me for a floorplan. Obviously I have loads of proper architectural drawings but they are huge and way too complicated to read easily on this blog. So instead I took the floorplan that the real estate used and just made the proper edits for what we changed. The things in the handwritten font are what we changed about the layout. Hope that helps you get a better sense of what I'm talking about most of the time. Love your floorplan...and double love that your parents live in the garden apartment...That is so perfect. I Love intergenerational stuff with some independent space! Thanks for showing me a view out your window. Living in a brownstone has always been on the list of houses I wanna try out! Gorgeous! Thanks for taking the time to answer everybody's questions, and showing the floorspace, which makes everything so much easier to visualize. And I agree with Linda above, living in a brownstone would also be my choice..and on the east coast, instead of a ranch style on the west coast. So I think I'm living vicariously through you. And now I'm off to check out your business. Ok, you dont look like Marissa or Kimberly. Not even close. Sorry. But you're a twin to Sophia Dahl. The similarity is amazing. Thanks for the ORK link. I just bought the Seattle poster for my boys' room. I love your floorplan. Thanks for sharing. Ahhhh, love the layout of your house, especially the his and hers closets! LOL. It's Estonian, Estonia is about 30 miles south of Finland, I live in CT though. Anyhow, you totally look like her. Google her! I love these last couple of posts with all the questions answered. What a great idea. I love learning more about you. So sweet that your in-laws live on the main level. Hope you enjoy your mini vaca. I did it! I am now caught up on your blog! I just discovered it a little less than two weeks ago and decided to start from the very beginning and read all your posts in ORDER. It took awhile (especially since I had to start at the bottom of every page), but I have thoroughly enjoyed my journey. Congratulations on the amazing transformation of your gorgeous home! By the way, I am so glad you went with the shiny floors. Lovely! My boyfriend agrees. We both love hardwood floors and hope to have some similar to yours one day (right now we're stuck with disgusting emerald green carpet in the studio we share). You must be so happy that you decided to blog your experiences. Anytime you're getting down on yourself for not accomplishing as much as you had planned, you should really check out your early posts and take a look back at where you started. :) Thank you for your ever entertaining blog. I have really enjoyed getting to semi-know you through the renovation of your limestone, and I look forward to reading more in the posts to come! Thanks so much for the floorplan! The layout of the house fell into place for me after I looked at it, makes it easier to visualise it now. Enjoy your trip and take care. I love that floorplan....and agree about the hadwoods floors. I am rethinking my dream to move to main, to Brooklyn. Never thought I'd say that 10 years go. Thanks for the floorplan. It really helps me understand the layout of your rooms now. Can't wait to see your updates on new projects! Hey Mrs. Limestone...I think I remember reading on here somewhere that you LOVE Project Runway. Well guess who I saw on the train Wednesday at 34th Penn Station?? LeAnn who won the last season. I didn't say hi, but totally wanted to! I a couple with the Mood bags, and thought, "oh look, somebody is shopping at the same place as Project Runway" then I looked at the girl, and it was Leann! She looked stressed, or tired. I'm in the midst of a major home renovation. Happy Homemaker kept urging me to check out your blog and I'm so happy I did. What a great resource! I can't begin to tell you how much I have enjoyed reading all your posts...I first came across your blog last month, but today I was able to read thru everything and I felt like I had a kindred spirit! As far as the demise of domino and a few other favorites...which has not hit me since the last issues were just received...Living etc from the UK is one of my favorites...available at Borders and Barnes. i haven't read everything so you may already know this, but i have a HUGE aversion to chalk so i use liquid chalk. they're like markers only for chalkboards! i found some at michael's. love the place!